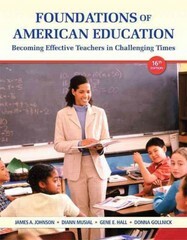 Foundations of American Education 16 Edition Note: This is the bound book only and does not include access to the Enhanced Pearson eText. To order the Enhanced Pearson eText packaged with a bound book, use ISBN 013338621X. The new Sixteenth Edition of this classic text presents a broad introduction to the foundations of education through discussion of theory and practice in such areas as advocacy; legislation; and the current social, political, and economic climate. In it, teachers gain a realistic perspective and approach to their work. Current, thoughtful, and completely up-to-date, Foundations of American Education presents a comprehensive look at the fast-paced world of information and the underlying constructs influencing today’s schools. The book includes comprehensive coverage of recent trends and issues in schools, the emergence of Common Core State Standards, RTI, and the continuing emphasis on assessment. The Enhanced Pearson eText features embedded video. Improve mastery and retention with the Enhanced Pearson eText* The Enhanced Pearson eText provides a rich, interactive learning environment designed to improve student mastery of content. The Enhanced Pearson eText is: Engaging. The new interactive, multimedia learning features were developed by the authors and other subject-matter experts to deepen and enrich the learning experience. Convenient. Enjoy instant online access from your computer or download the Pearson eText App to read on or offline on your iPad® and Android® tablet. * Affordable. The Enhanced Pearson eText may be purchased stand-alone or with a loose-leaf version of the text for 40-65% less than a print bound book. * The Enhanced eText features are only available in the Pearson eText format. They are not available in third-party eTexts or downloads. *The Pearson eText App is available on Google Play and in the App Store. It requires Android OS 3.1-4, a 7” or 10” tablet, or iPad iOS 5.0 or later.